excipients: Sodium dihydrogen phosphate dihydrate, disodium hydrogen phosphate dodecahydrate, benzalkonium chloride as 50% water solution, macrogol glycerol hydroxystearate, sodium chloride, disodium edetate, cineol (eucalyptol), levomenthol, sorbitol, purified water. decongestants for topical use, sympathomimetics, plain, ATC code: R01A A07. Xylometazoline is a sympathomimetic agent acting on alpha-adrenergic receptors in the nasal mucosa. 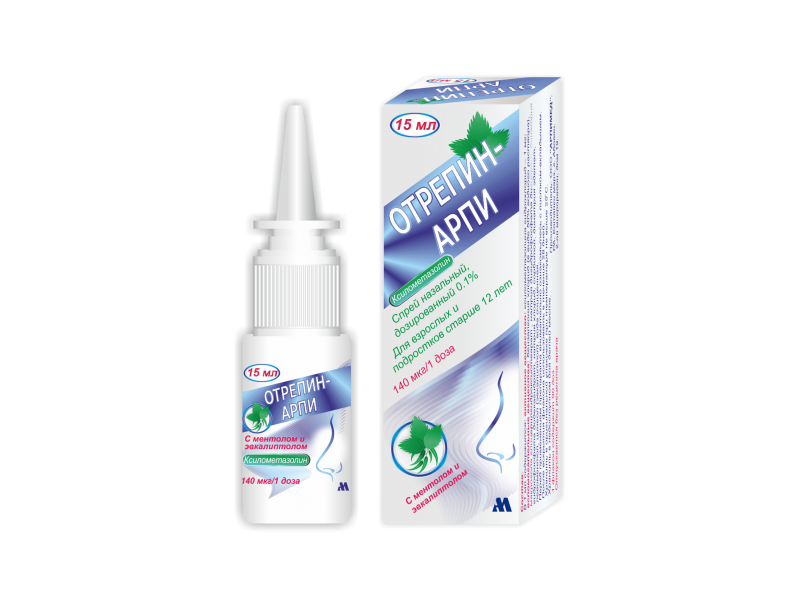 Administered in the nose, it constricts the nasal blood vessels, thereby decongesting the mucosa of the nose and neighbouring regions of the pharynx. This decongests nasal passages and enables patients suffering from blocked nose to breathe more easily through the nose. The effect of Otrepin-Arpi begins within a few minutes and lasts for up to 10 hours. In a double-blind, saline solution controlled study in patients with common cold, the decongestant effect of xylometazoline was significantly superior (p<0.0001) to saline solution based on rhinomanometry measurement. Relief of blocked nose developed twice as fast in the xylometazoline group compared to saline solution as of 5 minutes post treatment (p= 0.047). Xylometazoline is well tolerated, even by patients with a sensitive mucosa, and does not impair the mucociliary function. Plasma concentrations of xylometazoline in man after local nasal application of the product are very low and close to the limit of detection. Xylometazoline has no mutagenic effect. No teratogenic effects were shown in a study where xylometazoline was given subcutaneously in mice and rats. Otrepin-Arpi should not be used in children aged less than 12 years old. 0.1% Adults and adolescents over 2 years of age 1 spray into each nostril, 1 to 3 times daily as needed. Do not exceed 3 applications daily into each nostril. The metered-dose spray permits accuracy of dosage and ensures that the solution is well distributed over the surface of the nasal mucosa. It precludes the possibility of unintentional overdose. Before the first application, prime the pump by actuating 4 times. Once primed the pump will normally remain charged throughout regular daily treatment periods. Should the spray not be ejected during the full actuation stroke, the pump will need to be reprimed with the same number of actuations as initially performed. Be careful not to spray in the eyes. 1. Blow the nose gently. 3. Do not cut the nozzle. The metered-dose spray is ready to prime before use. 4. Hold the bottle upright with thumb under base and nozzle between two fingers. 5. Lean forward slightly and insert the nozzle into a nostril. 6. Spray and breathe in gently through the nose at the same time. 7. Repeat in the other nostril. 8. Clean and dry the nozzle before replacing back the cap right after use. To avoid possible spread of infection, the spray should only be used by one person. Like other vasoconstrictors, xylometazoline should not be used in patients with trans-sphenoidal hypophysectomy or surgery exposing the dura mater. Systemic cardiovascular effects have occurred, and this should be kept in mind when giving this product to people with cardiovascular disease. Adverse reactions are listed below, by system organ class and frequency. Frequencies are defined as: very common (≥1/10), common (≥1/100 to <1/10), uncommon (≥1/1,000 to <1/100), rare (≥1/10,000 to <1/1,000) or very rare (<1/10,000). Within each frequency grouping, undesirable effects are presented in order of decreasing seriousness. Xylometazoline, like other sympathomimetic agents, should be used with caution in patients showing a strong reaction to adrenergic substances, as manifested by signs of insomnia, dizziness, tremor, cardiac arrhythmias or elevated blood pressure. Otrepin-Arpi should not be used for more than seven consecutive days. This medicine macrogol glycerol hydroxystearate (2.50 mg/ml) which may cause skin reactions. This medicine contains benzalkonium chloride (0.05 mg/ml) which irritant and may cause skin reactions. Xylometazoline has no or negligible influence on the ability to drive and use machines. No foetal toxicity or fertility studies have been carried out in animals. In view of its potential systemic vasoconstrictor effect, it is advisable to take the precaution of not using Otrepin-Arpi during pregnancy. No evidence of any adverse effect on the breast-fed infant. However, it is not known if xylometazoline is excreted in breast milk, therefore caution should be exercised and Otrepin-Arpi should be used only on the advice of a doctor whilst breastfeeding. In rare instances of accidental poisoning in children, the clinical picture has been marked chiefly by signs such as acceleration and irregularity of the pulse, elevated blood pressure and sometimes clouding of consciousness. There is no specific treatment. Appropriate supportive measures should be initiated and symptomatic treatment under medical supervision is indicated. Like for all sympathomimetics, a reinforcement of the systemic effects of xylometazoline by concomitant use of monoamine oxidase inhibitors, tricyclic or tetracyclic antidepressants, cannot be excluded, especially in case of overdose. Clear solution, with menthol and eucalyptol (cineole) odour. 15 ml solution in plastic bottle with a metered-dose pump, plastic nozzle with cap. 1 bottle with insert-leaflet in cardboard box. 2.5 years. Do not use the medicine for more than 28 days after opening. Store at a temperature 8-150C, in a cool and dry place, out of the reach of children. Protect from light.